Few days back Nokia had given feelers of an impeding launch of new Asha series phone, and today it is out. 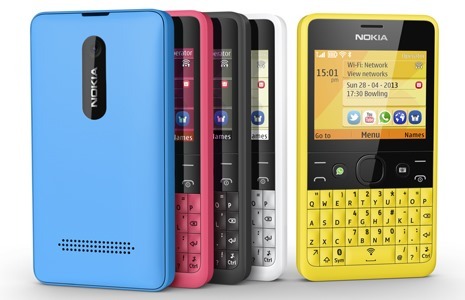 Nokia has announced launch of Asha 210, a qwerty phone with world’s first dedicated WhatsApp button. Nokia’s Asha series phones have tasted quite a bit of success in countries like India and have stemmed their steep fall in market share to a certain extent (Their market share in smartphones still remains quite dismal). With Asha 210, Nokia wants to bring seamless social interaction on the low cost phones in addition to little bit of pep with bright colors. As far as the specifications go, there is nothing out of ordinary. Nokia Asha 210 comes in 2 flavours a single sim and a dual sim version. The phone carries standard Series 40 OS with 2.4-inch QVGA (320×240) screen. Weighing at 97.3 grams, it has a internal memory of 64 mb and expandable upto 32 GB using an external memory card. From connectivity perspective Nokia Asha has Edge and Wi-fi connectivity (No 3G) and a single camera at back with a dedicated camera button. On the software side, there are some bells and whistles added. Like sharing of data on bluetooth without pairing the devices or their smart imaging software which enables easy self portraits using camera on the back. It has a Nokia Xpress browser which reduces your data usage by upto 90 percent. From specifications point of view, the biggest highlight of Nokia Asha 210 is its battery life which offers up to 46 days standby on the Single SIM and up to 24 days on Dual SIM phones. Nokia has not specifically mentioned price for India, but mentioned that it is expected to be priced at around USD 72. Pretty safe to say that it will be between Rs. 3500 to Rs. 4000 range in India. Excat date of launch is not mentioned either, but will be launched before the June 2013. While everyone is talking about smartphones these days, it is interesting that Nokia is still augmenting its forte, the feature phones. Nokia obviously thinks that in developing countries like India, there is still a long way before Smartphones take over entirely and hence launch of Nokia Asha 210. Whatsapp is definitely popular in India and use of Facebook and Twitter is growing at healthy pace and Nokia Asha 210 scores well here. Nokia is targeting college going kids and non-heavy internet users with this phone and it surely fits their need perfectly. They will not even update their OS… (Vulnerable with Java based Apps). @albert – exactly… I am so so surprised that Nokia decided to go with that age old OS… They did not upgrade anything..only the external polishing is what is going on…and I am not sure if that is going to take them anywhere….What say? Yes Arun. These types of Phones mostly attracted to OLD Nokia fans. They will fall in love with the design and look. This phone may get more sales in retail shops than the online stores.